The Anakeesta Rail Runner is the newest mountain coaster experience in the Smoky Mountains and is unique in that there is only a single rail! This allows you to ride lower to the ground as you race downhill through the trees of Anakeesta Mountain. You control the speed of your coaster cart so that you can enjoy a slower pace or a thrilling downhill journey reaching speeds of 25 miles per hour. While this might not seem much, just wait to see how fast it feels when you are just inches from the ground! Another unique aspect of the Anakeesta Rail Runner is that your ride begins at the top of the mountain rather than the bottom. The scenic uphill ride back to the top of Anakeesta Mountain offers the perfect opportunity to catch your breath! While experiencing the Rail Runner at Anakeesta in Gatlinburg, you can choose to ride solo or tandem with a small child. All of the Rail Runner carts feature back and headrests to ensure a comfortable and safe ride. Single riders must be at least 7 years old to ride alone, at least 48 inches tall and weigh a maximum of 270 lbs. If riding tandem, the combined weight cannot exceed 270 lbs., and passengers must be 3 to 7 years old with a minimum height of 38 inches. Note that the passenger also must be no taller than the driver’s shoulders. Since the passenger must sit in front of the driver, the driver must be able to control the braking lever at all times. When planning your trip over to Anakeesta to ride the Rail Runner, wear comfortable clothes that you don’t mind getting wet as rain can come and go quickly in the Smokies! While you can bring cameras and phones, we recommend securing them in your pockets before your ride. You are free to wear glasses and sunglasses, but a strap should be used if you plan on taking them off during your ride. If there are any valuables that you would like to leave behind before taking off on your adventure, there are small cubbies available for your convenience. 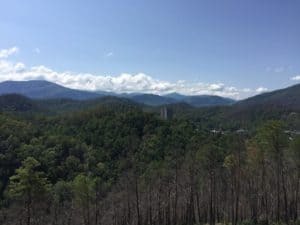 Stay close to the Rail Runner and all of the other exciting activities at Anakeesta in Gatlinburg with a vacation at Auntie Belham’s Cabin Rentals! Our affordable cabins have everything you need for a wonderful getaway to the Smokies, including scenic views, fully equipped kitchens, bubbling hot tubs and more! After a busy day at Anakeesta, you can look forward to returning to your cabin for an evening of relaxation and a comfortable night of rest! Check out all of our Smoky Mountain cabin rentals today to stay just minutes from Anakeesta in Gatlinburg! We hope to see you soon at Auntie Belham’s Cabin Rentals!